I have been asked to emphasise that the following is my own interpretation of the events of the past two years and in no way reflects the feelings of all the volunteers and supporters of the Barnsley War Memorials Project. I needed to get it off my chest and if you have read much of my blog you will know I find it cathartic to write about things that are troubling me. So that is what I did yesterday and the following is what I wrote. This post was going to be about my experience and that of my OH this weekend, I might still write that later. Sadly although the events of Friday were satisfactory and many, many people in Barnsley, who know no better, are very happy with our new 'public art', I found myself pouring out my frustration over the lack of interest from Barnsley Council over the past year. So, sorry, but this post has turned into a documentation of the efforts of myself and the Barnsley War Memorials Project to get 1 July 2016 to be a fitting Commemoration to the 800+ men from Barnsley who lost their lives 100 years ago in the Battle of the Somme. As the Commemoration of the First Day of the Battle of the Somme (Friday 1 July 2016) drew closer and closer I got more and more nervous about what I had set myself to do. Well over a year ago I started asking Barnsley Council what they were planning to do to commemorate this momentous event and was very disappointed in their lack of response. 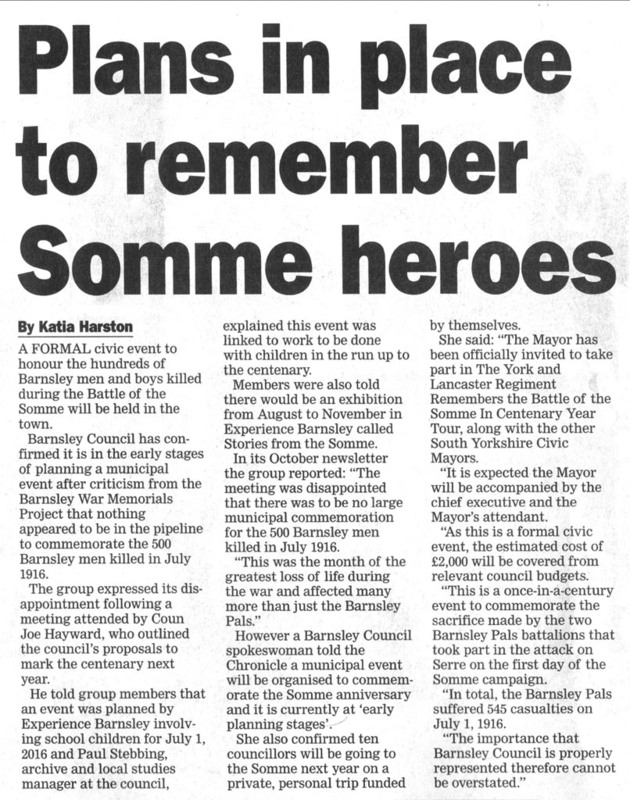 I wrote about suggested commemorations in the Barnsley War Memorials Project newsletter (May 2015), I spoke to my Councillors when I saw them in Cudworth, I spoke to other Councillors at various events, I spoke to Dan Jarvis, MP for Barnsley Central (he was sympathetic, but unable to interfere in Council business, and he noted that he would have to be in France himself that day as Labour lead for the Armed Forces). I asked the Barnsley Chronicle if they knew of anything planned. Eventually, in October 2015, a Councillor got in touch and offered to speak to our group at a meeting. At our meeting on 13 October the Councillor Joe Hayward, who is the lead on the Council for anything to do with the Armed Forces, spoke about a planned event to involve children's artwork with readings and music to take place around the War Memorial on 1 July 2016 [as you will have gathered this is exactly what we did get last Friday]. 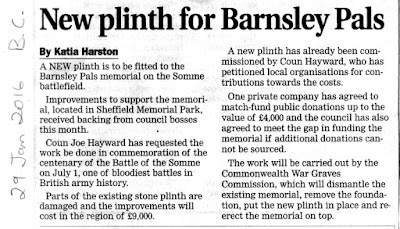 Joe also gave us details of the improvements planned to the Barnsley Pals memorial at Serre (which had been heatedly discussed in the Barnsley Chronicle between August and September 2014). The feeling of our meeting was made very clear - we wanted a full scale municipal commemorative event as the losses in life around the Battle of the Somme (and one of our members spoke eloquently about the tunnellers who lost their lives in the run up to the battle) were so significant that they deserved the very best we could do. We were also not terribly happy that money was going to be spent improving a memorial in France to just a few Barnsley men rather than here in Barnsley raising awareness of ALL the nearly 4,000 Barnsley men killed. After the Councillor left Paul Stebbing the Archives Manager also spoke, giving more details of the children's artwork idea and mentioning the Somme Exhibition to be held from August to November. 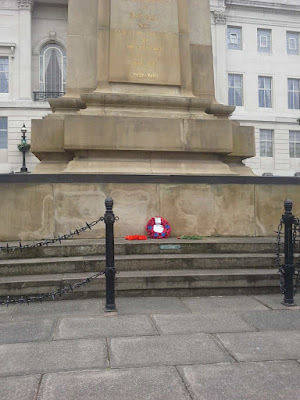 The following day I published a post on the Barnsley War Memorials Project site asking that the Council consider having a 'Proper Commemoration for Barnsley's Battle of the Somme Men'. I submitted a Freedom of Information Request to Barnsley Council asking who from the Council was going to Serre in July 2016 and how much was it going to cost. 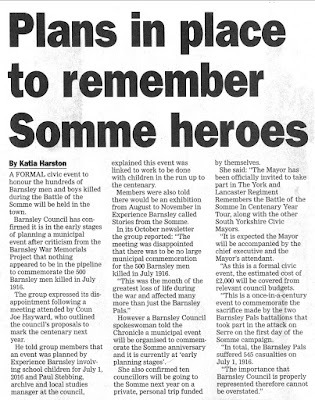 A week later, before I got my official response an article appeared in the Barnsley Chronicle which mentioned the BWMP criticism of the lack of a suitable plan to commemorate our Somme men. The Council had made a press release stating that "a municipal event will be organised to commemorate the Somme anniversary and it is currently at early planning stages." They also confirmed that the Mayor and two other would be going to the Somme paid for by the Council and that around ten other Councillors would make the trip at their own expense. 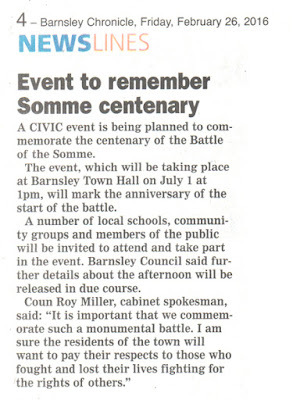 As I re-read the article now I can see that the lack of understanding about the difference between Barnsley men and the Barnsley Pals which has dogged the Council's press releases about WW1 is continued here. The Barnsley Pals Centenary Square was dedicated in August 2013. The Barnsley Pals were the 13th and 14th Battalions of the York and Lancaster Regiment, raised between September 1914 and late 1915. They did not reach a theatre of war until March 1916, by which time hundreds of Barnsley men in the regular army, navy and territorial force had already lost their lives or been wounded. When the square outside the Town Hall was renamed it should have reflected ALL the men from Barnsley who fought and fell, not just the 13th & 14th Y&L. 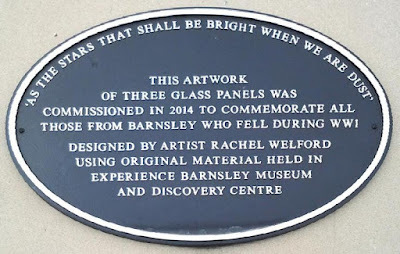 This misunderstanding was continued in 2014 when the glass panels now on display by the steps in the square were commissioned from artist Rachel Welford. The original brief of the art was to commemorate the Y&L, although later a plaque (see above) was added which stated that the panels commemorate all who fell in WW1. 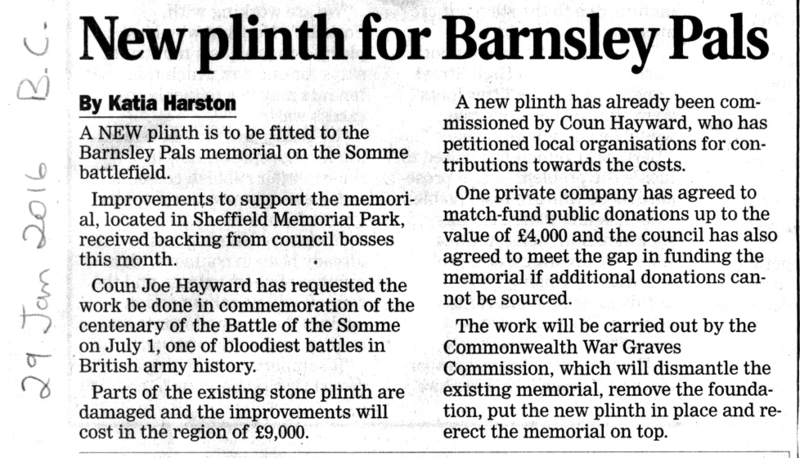 In January 2016 a piece appeared in the Barnsley Chronicle giving more details about the new plinth for the Barnsley Pals memorial in Serre, France. The cost of raising and moving the memorial was to be around £9,000. For a fraction of that money the BWMP could have had a commemorative book printed giving information on all 4,000 Barnsley men killed in WW1 and an online database with information about all our 630+ war memorials and the 14,294 men named on them (Boer War, WW1, WW2, subsequent conflicts up to the present day), which would have been available to everyone. We are not allowed to get funding from the Barnsley Wards as the project covers the whole borough!! In Feburary 2016 some of the Councillors (admittedly the cost was proposed to come out of their own pockets, but the Labour group paid the £1,000 in the end) bought a set of WW1 medals which had been awarded to a 'Barnsley Pal'. Sergeant Herbert Richard Johnson was born in Hull and had lived in Leeds. An old soldier (service reckoned from 1907), previously with the 3rd Y&L, he was transferred to 14th Y&L after they arrived in France in March 1916, probably to help train them up for the forthcoming battle. He was killed on 1 July 1916. Yes, he was a Barnsley Pal - but he was NOT from Barnsley. Also February 2016 this piece appeared in the Barnsley Chronicle. 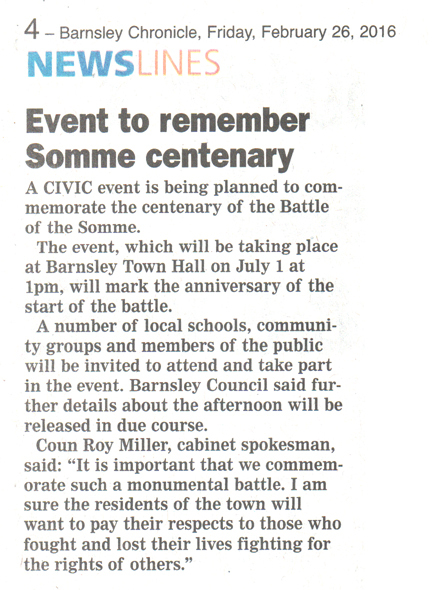 "A Civic event is being planned to commemorate the centenary of the Battle of the Somme. The event, which will be taking place at Barnsley Town Hall on July 1 at 1pm, will mark the anniversary of the start of the battle." The Barnsley War Memorials Project were invited to this event although our letter was addressed to the Barnsley War Memorials Group! I think it was at this point that I realised all we were going to get from the Council was the work from the Museum around the children's projects. I began to think about doing my own thing on the day. The government had already announced that country wide vigils would take place on the night before 1 July and I saw no reason why Barnsley couldn't do the same. If we had Council backing or even the support of some local business to open nearby toilets overnight I saw no reason why it couldn't be done very cheaply. 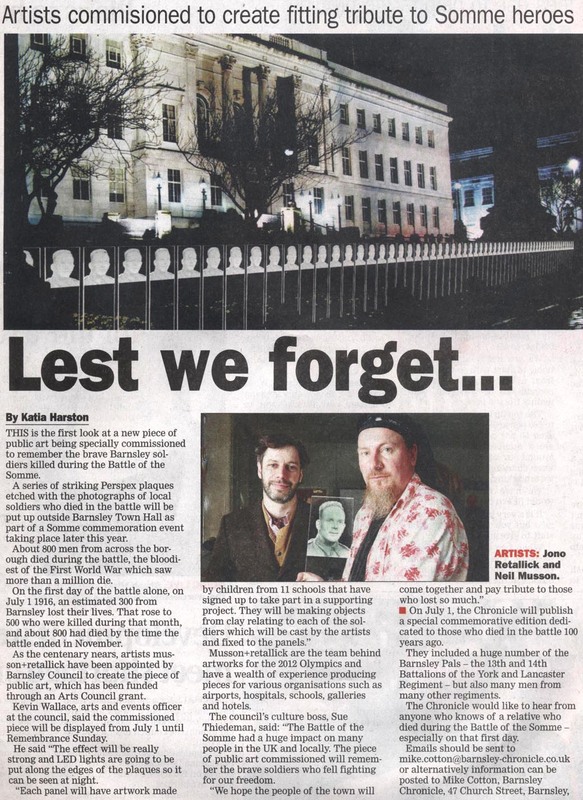 Mike Cotton at the Barnsley Chronicle approached the Barnsley War Memorials Project in early March 2016 about a commemorative issue of the Chronicle to be published on 1 July 2016. We had many conversations and he quickly grasped the numbers of men involved and the difference between Barnsley Pals and men from Barnsley. This was happily reflected in all future articles in the Chronicle, which despite the Council's continued lack of understanding of the difference, now frequently stated the latest accurate figures supplied by Pete and myself at the BWMP. We also shared our spreadsheets with Jemma Conway at Experience Barnsley so that she had a list of names to work from for the Stories of the Somme exhibition. Frequent additions and deletions were made to these spreadsheets as more and more of the soldiers were thoroughly researched or submitted by our supporters and family members. In April 2016 it was announced that there had been a piece of public art commissioned to be unveiled on 1 July 2016. Research online showed that this had been first advertised for tender at the end of February 2016, at around the time of the announcement of the Council's Civic event (see above). It seems that is when they got confirmation of funding to the tune of £17,750 from the Arts Council England. Nothing about this had previously been mentioned by the Council or anyone from Experience Barnsley. I must confess that the idea of illuminated perspex plaques did not appeal to me at the time. And adding the children's clay models to it sounded dreadful. In the same article Mike Cotton took the opportunity to ask for relatives of men killed at the Somme to get in touch with him to supply information for the Barnsley Chronicle commemorative edition. There were no plans announced for any commemoration at Barnsley prior to the 1pm unveiling of the artwork. By May I had decided I would do my own vigil, limited in time, but hopefully meaningful all the same. Somme wreaths were available from the Royal British Legion along with packs containing suggested verses, remembrance events, music and background information. 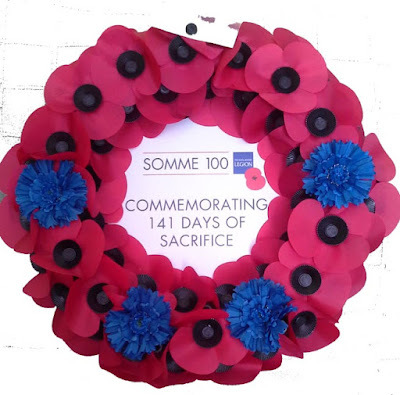 I downloaded the pack (I couldn't send for one as I am not an organisation) and to my great joy at the end of May our new Treasurer, Joe Pinguey from Penistone, gave me a Somme wreath for our Project which he had paid for personally. 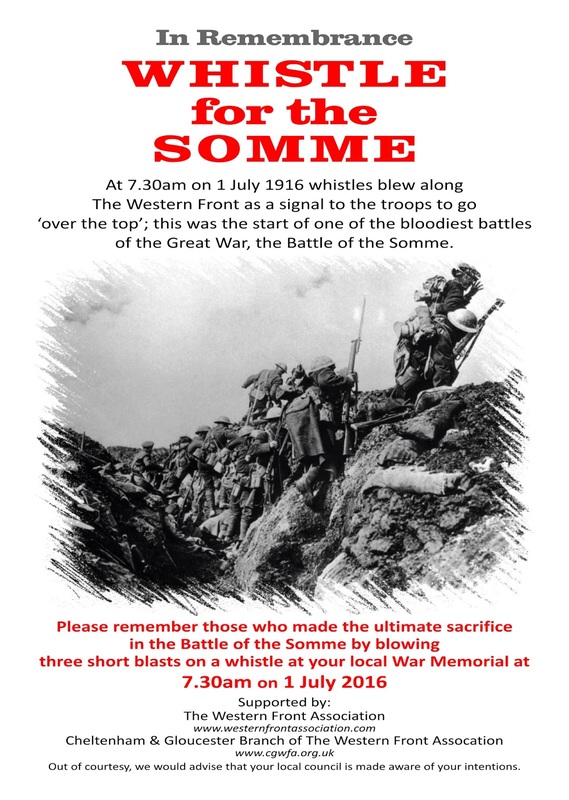 Whistle for the Somme was promoted by the British Legion and the Western Front Assocation and this seemed like a very touching idea to me. I obtained my very own (replica) trench whistle and planned to blow it at 7.30am on 1 July 2016. I began to advertise my intention to turn up at Barnsley's War Memorial at 6.30am on Friday 1 July with my whistle and my wreath. I informed the Council as advised by the poster on the left here. The day before the commemoration I was told by a friend that the Council would be doing a two minutes' silence at the war memorial at 7.28am. OK, I thought, at least some recognition by them, and I included this in my tweets and facebook posts. The OH and I arrived at Barnsley Town Hall just before 6.30am on Friday 1 July 2016. A few people were hanging around the memorial so my heart rose. As we walked up Regent Street (the OH was forced to park some distance away as many of the nearby parking spots had already been coned off) I could see that one gentleman was a Councillor I recognised. Better and better. Councillor Ken Richardson (who had previously helped us transcribe the 1918 Absent Voters list), thank you! He had turned up earlier and had been taking photos of the newly installed perspex plaques, which I now decided I did quite like. They were smaller than I expected and each one showed two men's profiles and had one flat disc of brown material affixed, roughly the size of a Dead Man's Penny, which turned out to be the children's art. By 7.15am we had been joined by an ex-soldier, Andy, who also volunteers for the Barnsley War Memorials Project, and his wife, by an ambulance crew who pulled in across the road and came over to join us and all in all there were around a dozen of us there. I read the verse that starts, "They shall not grow old .." and then we stood in silence for the two minutes. I blew my three short blasts on my whistle and finished with the verse, "When you go home, tell them of us ...". I laid my wreath and Andy laid his, from his regimental association. A pair of men who had already told us about their relative who served in WW1 laid some flowers. It was OK, it all went very well, I almost cried a couple of times, but I held it together. Thank you to the OH, and Cllr Ken and Andy and the other people who turned up. Thank you all. I won't write about the ceremony at 1pm. That was OK too. Not what I had hoped for, but 'better than nothing' as I've been telling myself for months now. Everyone likes the perspex plaques and the #wearehere soldiers put in an appearance too! A very interest account, Linda, thank you.